IMPORTANT: For maximum profit potential, respond by 11:59 p.m. on . From now until 11:59 p.m. tonight, I’m giving away one free year of access to my profit-gushing Lightning Trend Trader service. Normally we charge $4,000 for a single year. But today I’ve decided to waive that fee for one full year of service. By this time next year, you could become a millionaire. Vietnam veteran Anthony Valentino said he and his brother made approximately $1.3 million following my advice last year. So why would I give away a free year of research that’s performing so well? Last February, I uncovered a surging biotech, AbbVie, with a revolutionary Alzheimer’s breakthrough. In it, I made clear just how much money I expected people could make in one year. That’s right. I was so confident, I guaranteed it. Yet not everyone believed me. Another sarcastically mocked my guarantee, as if there were no way I could deliver. But they couldn’t see what I saw. They didn’t know about the Alzheimer’s breakthrough that was coming. A return of 2,381%, to be exact – my personal record, and the second-highest ever in the history of The Oxford Club. Anthony Valentino, whom I just mentioned, was one of the few people who took me up on the offer. It was a HUGE win for a small group of our subscribers... one of the biggest EVER in our 25-plus year history. And yet... there was one problem. In fact, only 350 people claimed a copy of the report where I showed exactly how to profit from this opportunity. Given that there are 150,000 Oxford Club subscribers, that’s unacceptable. Less than 1% of our Members took action and captured this life-changing gain. That’s why, today, we’re making damn sure it doesn’t happen again. We’re giving away a free year of my research service to whomever responds to claim it today. That way, you have a full 12 months to follow my new millionaire-making play with me at your side. We could end up giving away $2 million worth of subscriptions – or more. Our whole mission here at The Oxford Club is to help you achieve complete financial freedom. Just think about the life you’d live as a millionaire. And he plans to take his family on three international vacations every year before his granddaughters reach college age. Or give back to your church or a charity, or start a scholarship program. All you have to do is watch this video to the end and follow my instructions to claim your FREE year. This time, there is NO LIMIT to the number of people I’m letting in. And I don’t want ANYONE to miss it. Given my PROVEN strategy, you’re looking at capturing a 3,000% monster of a trade. And once again, I’m willing to guarantee it. and This Is Your Chance to Join Them! My name, by the way, is Marc Lichtenfeld. I’m the Chief Income Strategist here at The Oxford Club. My life’s mission is to help you grow and preserve your wealth swiftly and safely. And I love it. It’s my dream job. I’ve been in this business a long time, and I’ve made a big difference in people’s lives. 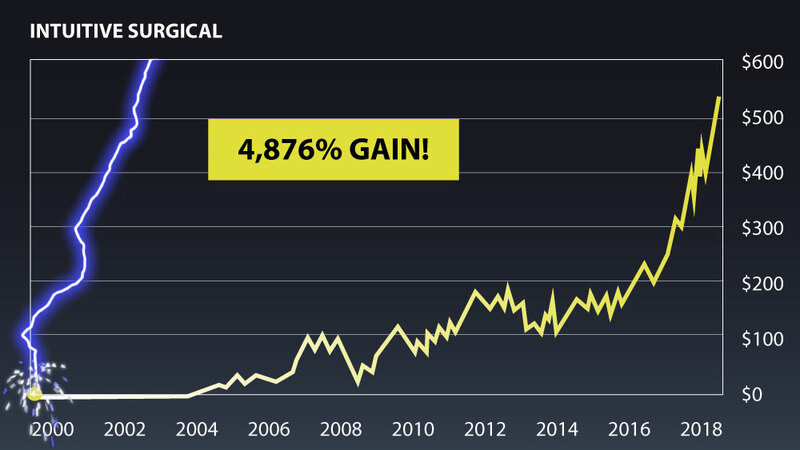 My Lightning Trend Trader service has outperformed the S&P 500’s average annual return by an incredible 2,052%. Here’s what that has looked like since 2012. And these aren’t just numbers on a page. I have countless letters in my inbox from real subscribers who are living their dreams because of my research. Malcom Severson sent me one of my favorite notes I’ve ever gotten from a reader. It’s a little long, but I think it’s important to share. For me, this is what my job is all about. It’s about helping people to take control of their lives... to take pride in providing for themselves and others. One with a 3,000% potential that could make you a millionaire in 12 months. 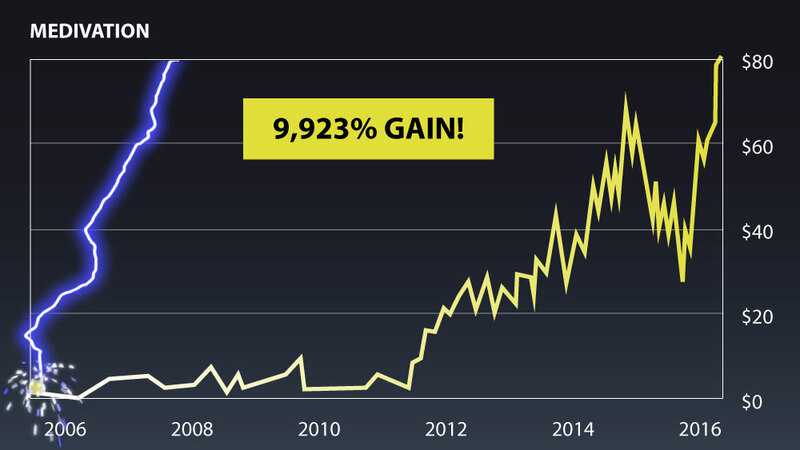 Of course, 3,000% is exceptional – results like that don’t happen every day. But that’s exactly why I want to give you a FREE year of Lightning Trend Trader today... so you don’t miss this rare opportunity. And there’s a good reason I’m so confident. I’ve been able to identify some of the biggest winners in the history of the market. The strategy I use is a powerful, proven way to make a LOT of money in a short period of time. That send seemingly normal stocks to the moon. 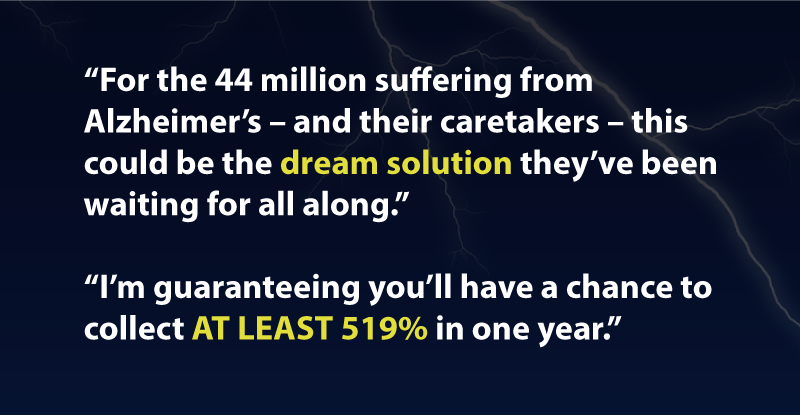 But then, when a Lightning Strike occurs, you have the opportunity to become a millionaire. That’s why I’ve dedicated so much of my life to becoming the foremost expert on these potent market events. My track record is loaded with examples of subscribers getting the opportunity to make huge money on Lightning Strikes. A couple of years ago, I discovered a company called Onyx Pharmaceuticals. It was successfully treating kidney and liver cancers with a drug called Nexavar. But I knew it wouldn’t stay cheap for long. So on April 2, I recommended that my subscribers take a position in Onyx. And subscribers had the chance to lock in a 330% gain in just a couple of months. Similarly, my subscribers had the chance at a massive payday with Celldex Therapeutics. For about a year, the stock did absolutely nothing. But I knew a Lightning Strike was coming up. Celldex was targeting triple-negative breast cancer – a rare, deadlier form of the disease. And it was getting ready to release Phase 2 clinical trial data – a powerful type of Lightning Strike. So I sent an email to my subscribers on November 28... right before this big event. And shares in Celldex SURGED 419% in under a year! The stock soared from $6 to more than $30! And $5,000 turned into nearly $26,000 with ease. Around the same time, I discovered NPS Pharmaceuticals. It sold a drug called Gattex to treat short bowel syndrome. It’s a rare disease affecting as few as 12,000 Americans. So it’s really no wonder why Wall Street wasn’t paying close attention. NPS was doing practically nothing for an entire year. But I knew how revolutionary its drug Gattex was. Sufferers of short bowel syndrome experience severe malnutrition. Patients must be hooked up to a feeding tube for hours a day. But Gattex was set to transform these patients’ lives. I knew it was going to be a big Lightning Strike for NPS. So I sent an email to my Lightning Trend Trader subscribers. Those who followed my recommendation saw a 775% gain in their accounts! Every $5,000 exploded into $43,750. That’s a lot of money in such a short period of time. And then, of course there was the giant win in AbbVie. It was hovering around the same price for three years. It seemed like the stock was dead in the water. But then I discovered that it had partnered with Google on an incredible Alzheimer’s breakthrough. I quickly shot a special video on the opportunity and sent it to all my subscribers. Then, just as I predicted, lightning struck. The stock went on a tear. 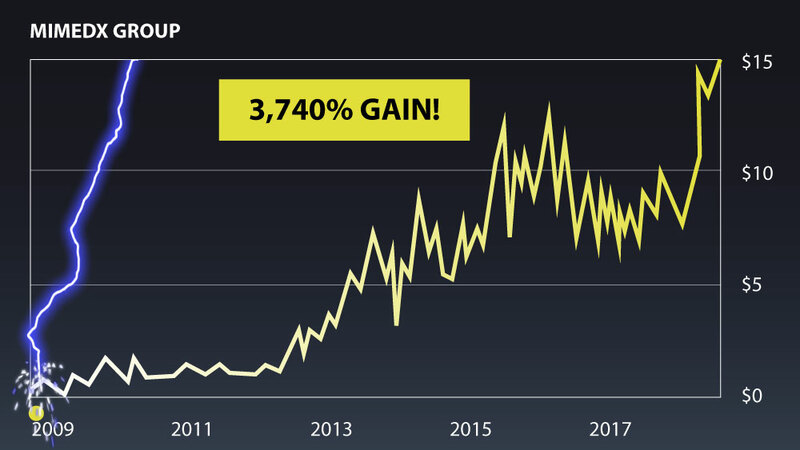 My subscribers had the chance to lock in a 2,381% gain in just 10 months. Anthony Valentino and his brother made $1.3 million on this very recommendation. That’s the power of Lightning Strikes. Of course, this is just a small sampling of the best wins I’ve helped my subscribers collect. 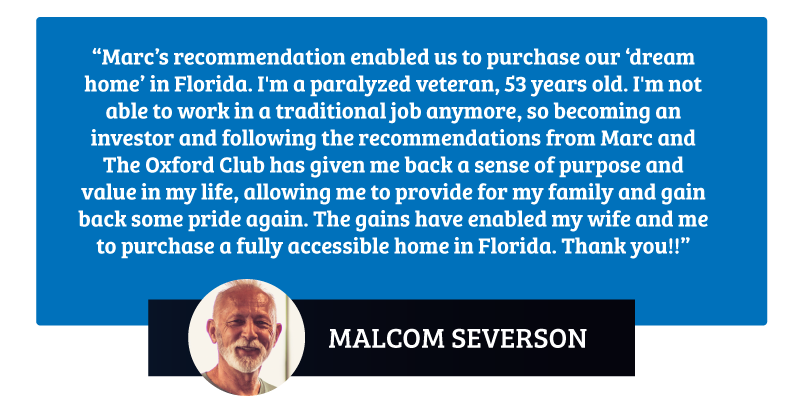 In my time at The Oxford Club, I’ve recommended 133 triple- and quadruple-digit gains across my services. 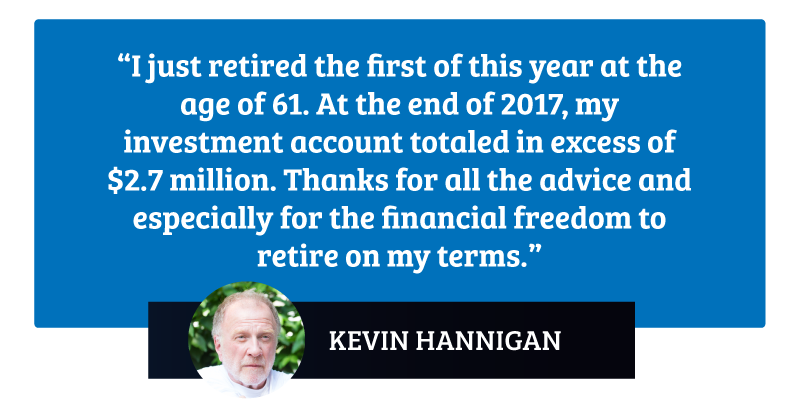 The problem is, most financial advisers will tell you the only way to make money is to sit on an index fund for 40 years and pray for 7% annually. That bad advice is so deeply ingrained into most investors’ brains. And that’s probably why the vast majority of Oxford Club subscribers missed out on the chance to make a million dollars on my huge AbbVie win. And today, you’re getting a second chance. I’ve found a new stock about to experience a Lightning Strike. And I believe this one could set my all-time record for gains. It’s bigger and better than AbbVie. And I believe it could hand you a 30X gain. The reason I’m so confident is simple. A 3,000% winner is possible when you see the telltale signs of a Lightning Strike about to hit. 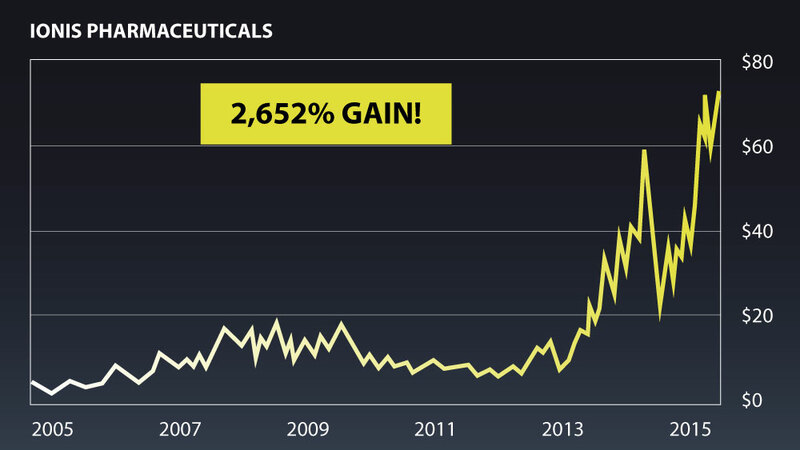 Gains that big are relatively common in the biotech market. 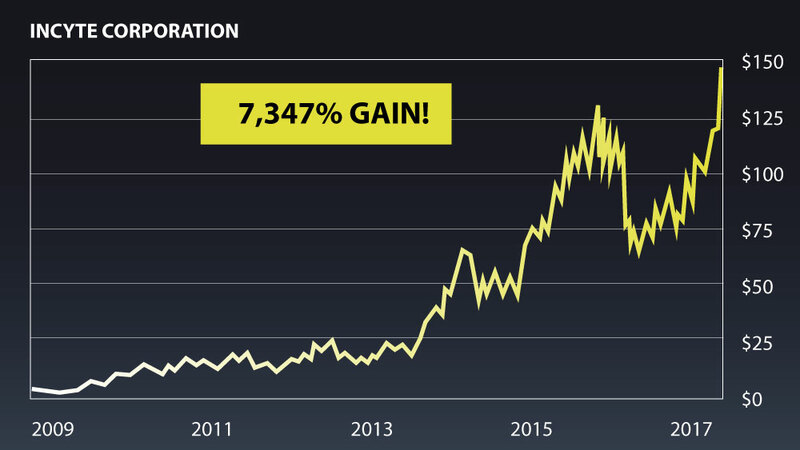 And this company went on to deliver 3,168%! 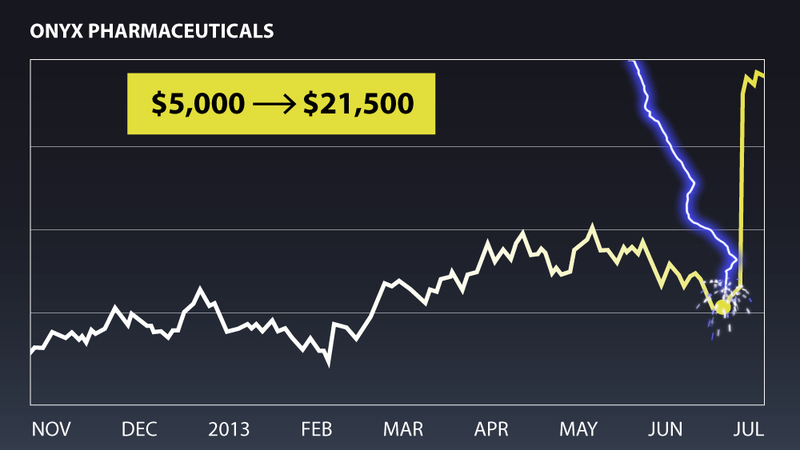 BioMarin Pharmaceutical was trading for less than $4 on November 5 a few years ago. Then, lightning struck. It announced Phase 3 trials for its drug Phenoptin. The stock went on to deliver 3,637% gains! MiMedx Group experienced the same. It delivered 3,740%! Again, exceptional examples like these are certainly rare. But like I said, just one of these Lightning Strikes can light a stock up and multiply your money many times over. And the play I want to share with you today is definitely primed for a Lightning Strike. One that allows it to capture millions in profits from drug sales... WITHOUT paying for the expensive FDA testing. But here’s what makes it truly unique. But a bevy of Lightning Strikes one after another. This company is basically a lightning rod. It has so many catalysts coming up, it would take a nearly impossible series of events to keep this stock price down. Of course, there are still risks. Anyone who tells you they can predict the market with 100% accuracy is full of it. There’s always the chance you’ll lose some money or make less than projected. And the next one for this company is coming on June 30. You’ll want to be in well before that happens. In fact, I recommend getting in TODAY for maximum profit potential. Because once the momentum gets going, the price will shoot to the stars. After all, I can’t give away $4,000 subscriptions forever. After tonight at midnight, you may never see this invitation again. Here’s what you need to know about the potential 3,000% winner... and its upcoming parade of Lightning Strikes. And it’s the best-kept secret in the market. You’re probably familiar with the concept of royalties. What most people know about royalties is that they’re a payment you receive over and over again, usually on a song or a book. There are ALL sorts of ways to collect royalties. And the companies that collect these royalties can make a fortune. Take MV Oil Trust, for example. It holds royalty interests in about 1,000 oil and natural gas fields. It doesn't do ANY work. It just gets a piece of the profits. Over the years, it’s collected $266 million in royalties. And as a result, MV Oil Trust delivered a 563% gain! 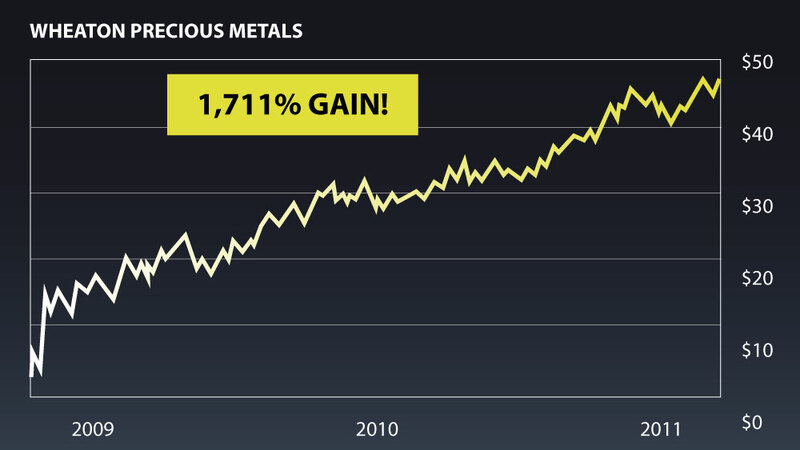 Wheaton Precious Metals is another great example. It collects silver and gold royalties. And as a result, investors in its business earned as much as 1,711%! $5,000 would have turned into $90,550 in just a few years. It currently collects patent royalties of $16.25 on smartphones. And its stock has increased as much as 7,181% over time! Companies that collect royalties are some of the most profitable types of businesses you can invest in. Period. And the company I’m talking about today is in an even better sector for royalties. This company collects royalties on pharmaceutical drugs – which may just be the most lucrative business in the world today. You see, drug royalties offer gigantic payouts. And the companies that own the rights to these royalties can make a fortune. They’re able to collect this cash simply by investing in a drug before it goes to market. Then the cash rolls in for years and years. And they don’t have to spend millions on research and development, FDA testing or marketing. If you can identify a winning drug, this is EASY MONEY. Because you’re legally entitled to receive the royalty for years... sometimes forever! Just imagine the following scenario with me real quick. Let’s say you were able to secure a royalty on the blockbuster of all blockbuster drugs, Lipitor. And let’s say the rate was something tiny – like half a percent. That would mean that for every $100 of Lipitor sold, you’d make $0.50. It’s a small cut. But you don’t have to do anything. You own the rights in perpetuity. You just collect every single time somebody walks into a pharmacy and picks up their prescription. At its peak, Lipitor did $12.9 BILLION in sales. Even with your small cut, that means you would have made as much as $64.5 million in a year. And with Lipitor’s lifetime sales clocking in at $141 billion, that means over time you would have collected a whopping $705 million. Just by securing a small 0.5% royalty stream. And here’s the thing... royalty agreements are usually much higher than that. The company I’m talking about today collects royalties as high as 20%! Now, imagine how great life would be if you truly had access to the benefits of a drug royalty like that. You may think it’s impossible, but with the company I’m about to show you, that’s exactly what you’ll get. It’s a chance to reap the benefits every single time somebody picks up a prescription anywhere in the country. In fact, the company I’m looking at is primed to be the No. 1 drug royalty company in the world. A Nearly Endless List of Upcoming Lightning Strikes! But a whole storm of them. It has one of the biggest portfolios of drug royalty streams out there, which means every time one of these drugs has a big sales quarter... another Lightning Strike will send this royalty company higher and higher. Over the last few years, it’s quietly gone around making deals with virtually all of Big Pharma. These include drugs that treat major diseases like cancer... osteoporosis... bipolar disorder... epilepsy... and more. These 18 drug royalties alone are set to hand the company a projected $116 million in revenue this year... without it having to develop or market any drugs itself. This company has also ALREADY locked down royalties on drugs in the approval process. In total, it has 165 drug programs it’s set to collect on. Revenue could breach $5.8 BILLION. Let me show you exactly how this works with each drug. This company’s main offering is a proprietary molecule it acquired from scientists at the University of Kansas... and now licenses out to other businesses. 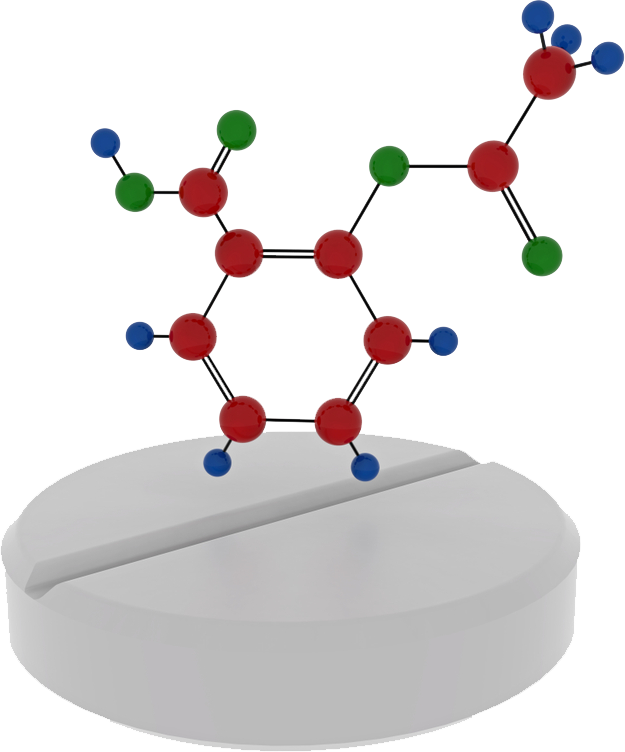 This molecule is really special. It makes drugs better, more stable and better absorbed by your body. In fact, it can make drugs up to 25,000 times better absorbed. Of course, drug companies want their products to be as effective as possible. This technology – and others like it – is why this no-name biotech has been able to make deals with pharmaceutical giants like Pfizer, Merck, Novartis, Gilead, Eli Lilly and more. Drug companies add this molecule to make sure their drugs are as effective as possible. Then, when the FDA approves it, this molecule becomes a permanent part of a drug’s formula. That means every time the drug is sold, our company collects a piece of the action. Millions in Revenue... WITHOUT Lifting a Finger! Amgen has a drug called Kyprolis. Kyprolis targets multiple myeloma, a cancer of the white blood cells. It goes after a specific enzyme to make tumor cells self-destruct. But to make the drug even better, Amgen added this royalty company’s proprietary molecule to the mix. In clinical trials, this combination kept patients from getting worse – and helped them live 20% longer. For a disease with a 50% survival rate (in other words, a coin toss), this drug was a godsend. Amgen pulled in $835 million from Kyprolis last year. But because it used this royalty company’s proprietary molecule, Amgen had to pay our drug royalty company $17.6 million. Now, let me be clear. The royalty company didn’t have to develop Kyprolis... or market it... or do a lick of work distributing it. Amgen did all that work. And because of this relationship, every time Amgen reports earnings, it’s a potential Lightning Strike for our small royalty company. But remember, Kyprolis is just one of the many drugs in our royalty company’s portfolio. This molecule is actually in 10 FDA-approved drugs. And the royalty company currently collects on all of them. There are also 50 drugs incorporating this molecule currently in development. Because clinical trials and approvals can be one of the most powerful catalysts in the entire market. 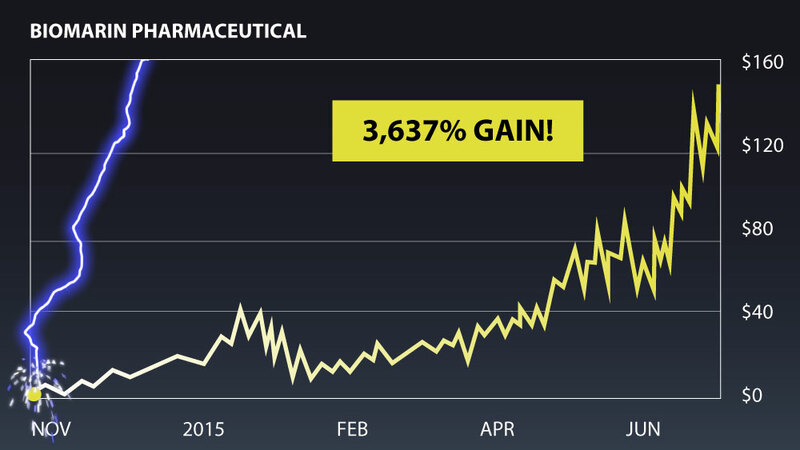 For example, Aquinox Pharmaceuticals jumped nearly 1,000% in just three days on good clinical trial data. There’s no other event in the market that can get investors this excited. 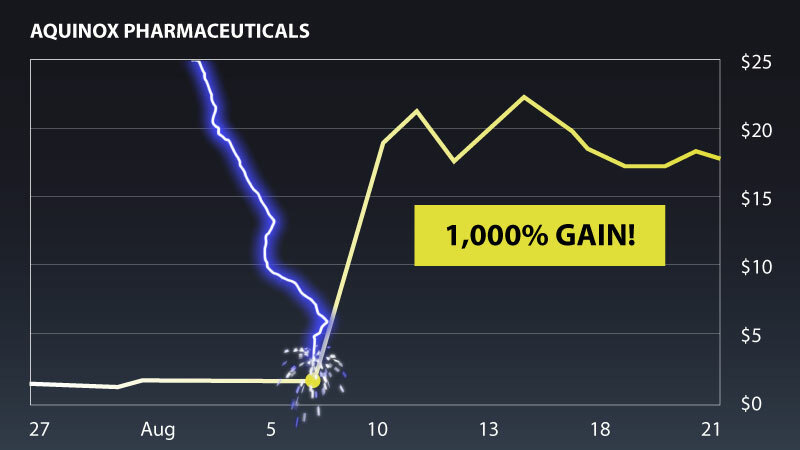 And in fact, drug royalty companies offer some of the biggest gains every time they experience a Lightning Strike. 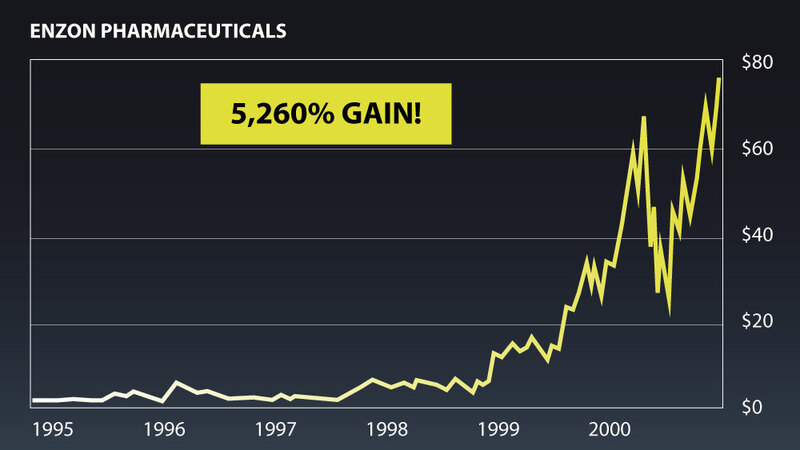 Let me show you the incredible gains other drug royalty companies have delivered in the past. Last year it collected $112.5 million in royalties from a drug called Spinraza. It’s a drug that’s helping people with spinal muscular atrophy stop the progression of their disease – and even increase their motor function. But here’s the thing. Ionis didn’t have to grind out all the sales and marketing for this drug. It licensed it out to Biogen, which did all the heavy lifting. Ionis just sits back and collects the royalties. It’s this business model that sent shares of Ionis skyrocketing. Since 2007, it’s collected more than $2.4 BILLION in cash royalties and similar agreements. 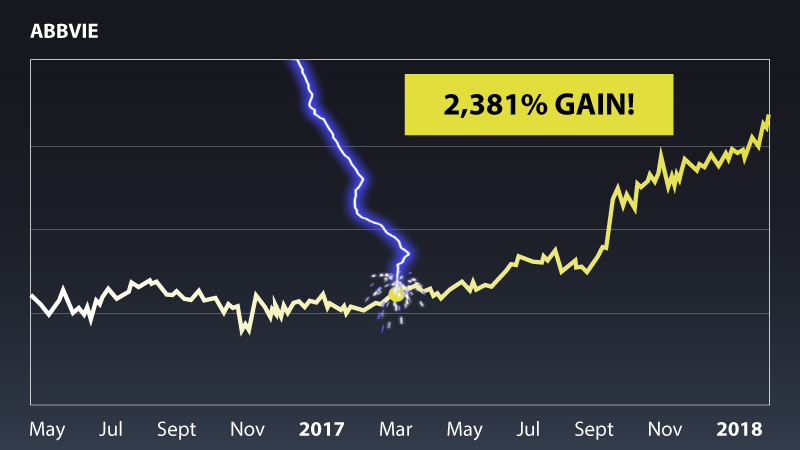 It delivered a 2,652% gain since 2015! Every $5,000 turned into $132,600. 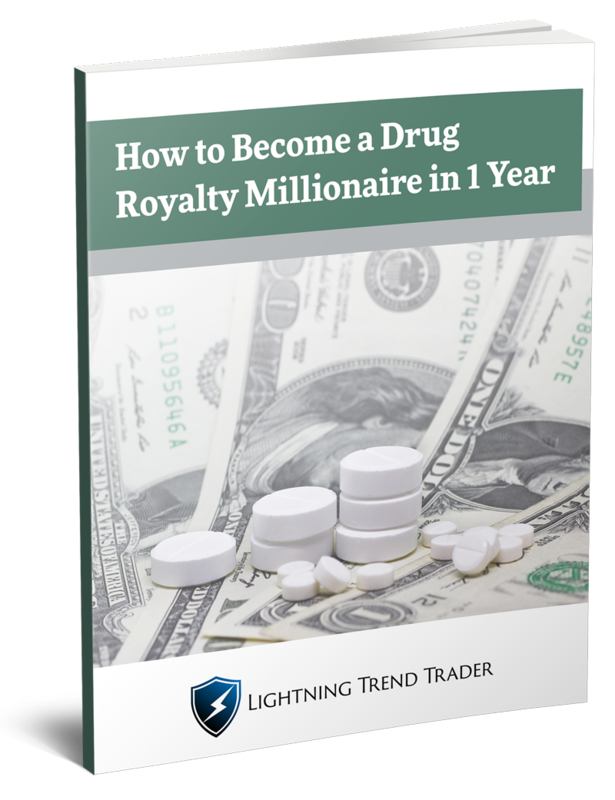 Most investors missed out because they had no idea just how profitable drug royalties can be. You probably also missed out on Enzon Pharmaceuticals. It collects royalties on a drug called PegIntron. 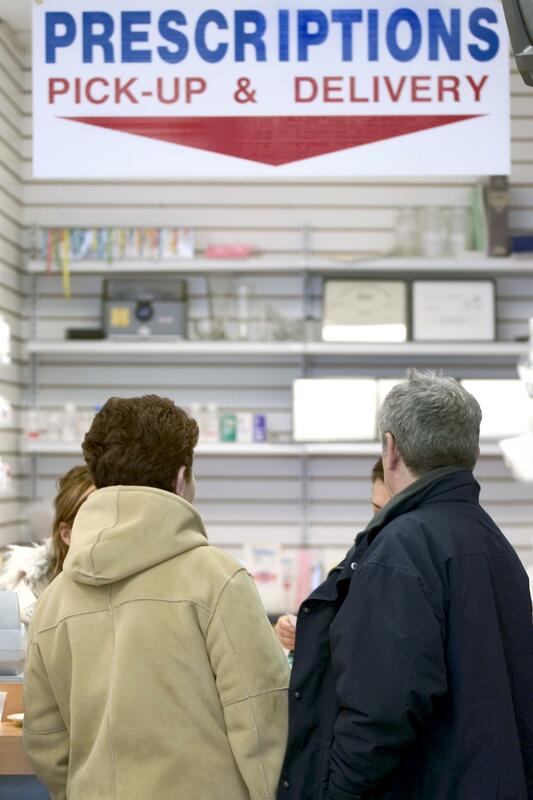 It’s a drug for hepatitis C. And every time a prescription is filled, Enzon gets a piece of the proceeds. For years and years, the cash comes rolling in. 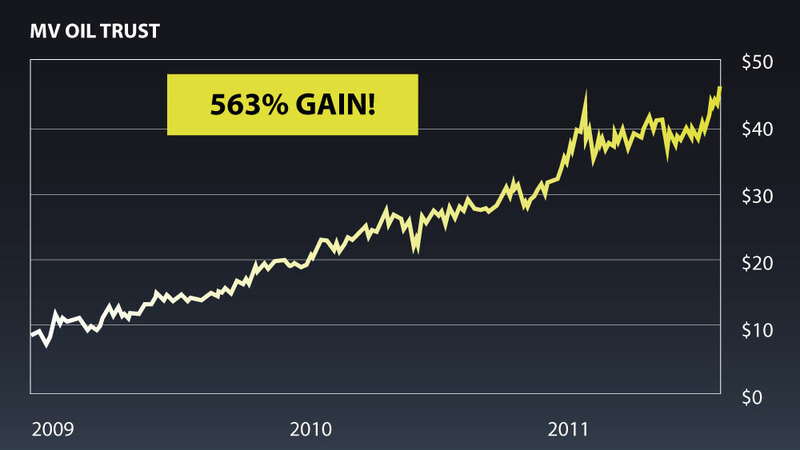 It’s this business model that helped propel its stock a massive 5,260% over time! This business model is so profitable that Carl Icahn took a 15% stake in this company a couple years ago. He bought almost 6.6 million shares. Investors also had the opportunity to make a killing on Incyte Corporation, another biotech royalty company focusing largely on cancer and immunotherapy. Because of cash-rich agreements like these, Incyte delivered a massive 7,347% gain between 2009 and 2017! $5,000 here turned into $367,350. But they have IMMENSE potential for growth. And remember, the company that could hand you 3,000% has 18 FDA-approved drugs in its royalty portfolio... and 165 drugs in total! It’s set to collect $184 million this year alone... and perhaps as much as $5.8 billion going forward. When these drug royalties start paying out in full, the profits will be immense. This stock will take off. And if you’re not in by then, your chance at becoming a millionaire in one year will likely evaporate. My 3,000% estimate could end up being conservative. 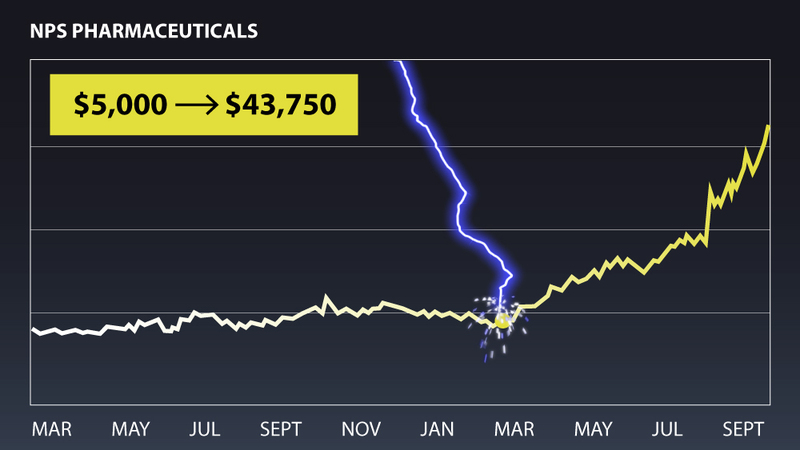 There are dozens of examples of biotech stocks that experience a Lightning Strike... and then blast higher by even more than 3,000%. After all, Incyte went up more than twice that amount. And Medivation, which soared a whopping 9,923% after acquiring revolutionary compounds for prostate cancer. 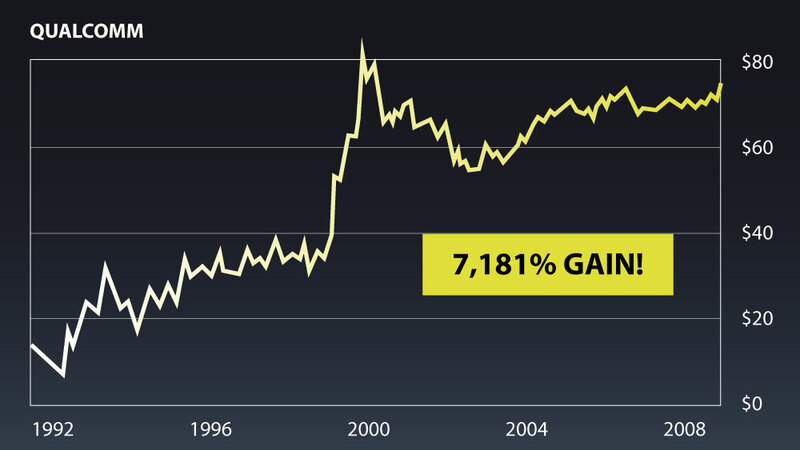 We made 2,381% – and we did it in less time too. Anthony Valentino’s family ended up making $1.3 million. But too many missed their opportunity. Which, again, is why I’m giving away one free year of Lightning Trend Trader today. I want to ensure not one single subscriber misses this next 3,000% opportunity. I’m confident this company won’t stay under the radar for long. 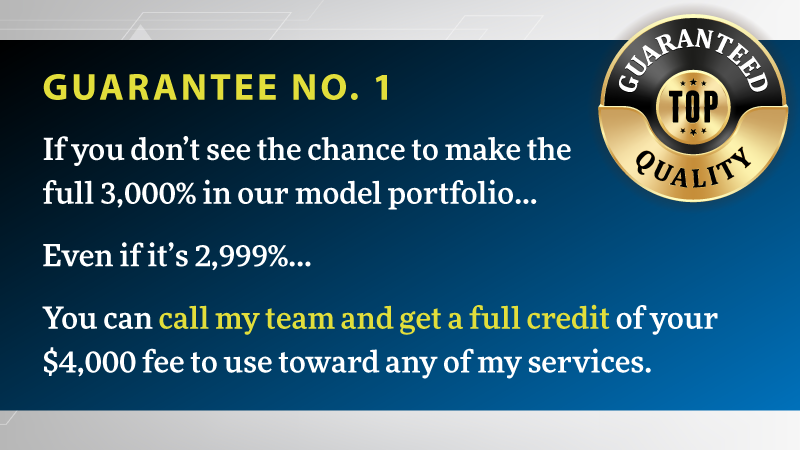 So to maximize your chance at 3,000%, you need to act now. I’m expecting big new drug royalty announcements to hit on June 30. A DEEP Portfolio of Revolutionary Treatments... All Primed for Lightning Strikes! For example, our biotech royalty company has an agreement to collect on a drug called Sparsentan. It’s being developed by a company called Retrophin. It’s for a serious kidney disorder that affects 40,000 Americans. 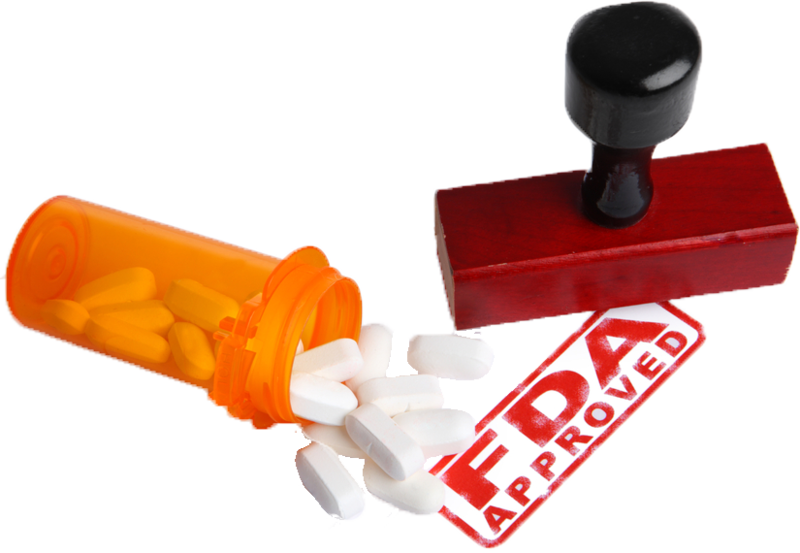 Sparsentan is currently in Phase 3 trials, which is the last stage before FDA approval. Passing Phase 3 is, of course, another potential Lightning Strike. But that’s not where the catalysts end. And that means a virtual monopoly when it hits the market. That’s why analysts estimate it’s as much as an $800 million opportunity. 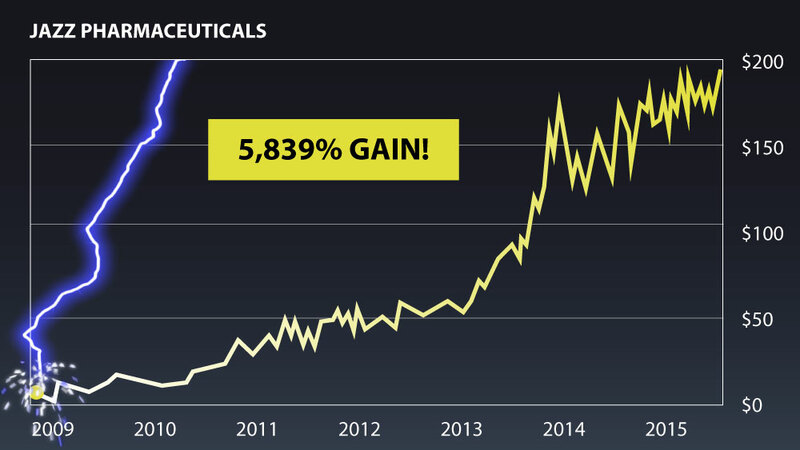 Our biotech royalty company will collect 9% of all sales of this drug. It also has a royalty on a Pfizer drug for preventing osteoporosis, which is soon to be a $25 BILLION market. And our drug royalty company even has rights to a whole new type of drug called human therapeutic antibodies. This cutting-edge development is the industry’s fastest-growing class of drugs, set to do $115 billion in annual sales. Dozens of Big Pharma companies are using and developing this type of drug. And again, our drug royalty company is in the catbird seat. It’s set to collect royalties from pharma giants like Merck, Teva, Celgene, AbbVie, Aptevo and more. I could go on and on. The company’s drug royalties span all sorts of diseases and subsectors of the biotech market. That the revenue potential is off the charts. I believe the sales and royalty streams could end up much higher. I want to answer a question that’s probably burning in your mind right now. You may have heard that biotechs are risky. And if you don’t know what you’re doing, that certainly can be true. But if you have an expert on your side, you could make a life-changing amount of money. 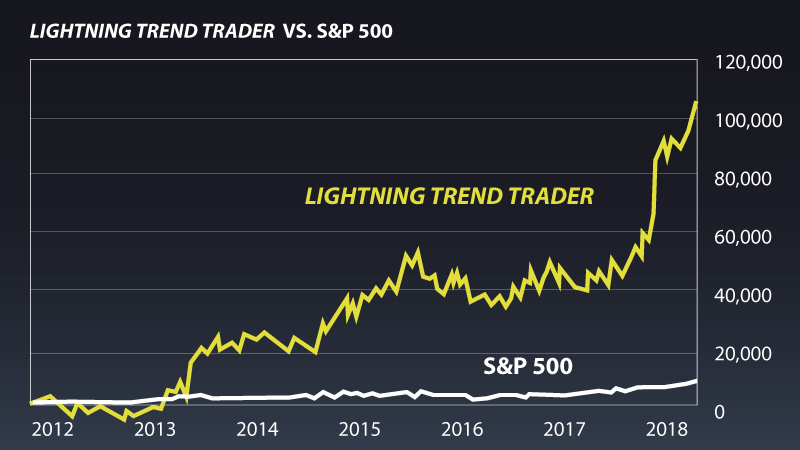 Again, here’s the track record of Lightning Trend Trader vs. the S&P 500. This isn’t cherry-picked. It includes all my winners and all my losers. My returns make it look like a flatline! As I’ve already mentioned, this strategy is what helped subscribers collect $200,000... $1.3 million... even $2.4 million! You don’t get this far without a strategy to manage your risk... and let your winners run for as long as possible. In fact, managing risk is my specialty. It’s a discipline I’ve developed for a very important reason. I have more than 600,000 readers all around the world. And that means I have an incredible responsibility. I never want my subscribers to lose. So I’m ALWAYS considering risk. And I’ll even show you a way to collect MASSIVE gains “risk-free.” This method was a big part of my 2,381% millionaire-minting win. Especially on plays with as much upside as the 3,000% winner I’ll share with you today. This trade is built to be as low-risk as possible. It’s not a company with one experimental treatment that could fail and tank the stock price. And it’s always looking for more. Except with a LOT more upside. This is hedge fund-quality research. Again, I’m even guaranteeing your chance at success here. 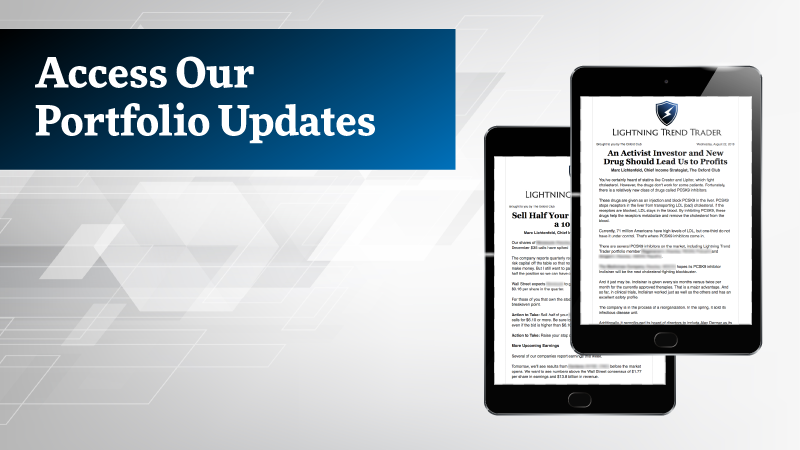 You need to claim your free year of Lightning Trend Trader at the end of this presentation. When you join, I’ll send you all the details on the small drug royalty company I believe could make you a millionaire. The title may seem outlandish, but I’ve already proven it’s achievable. 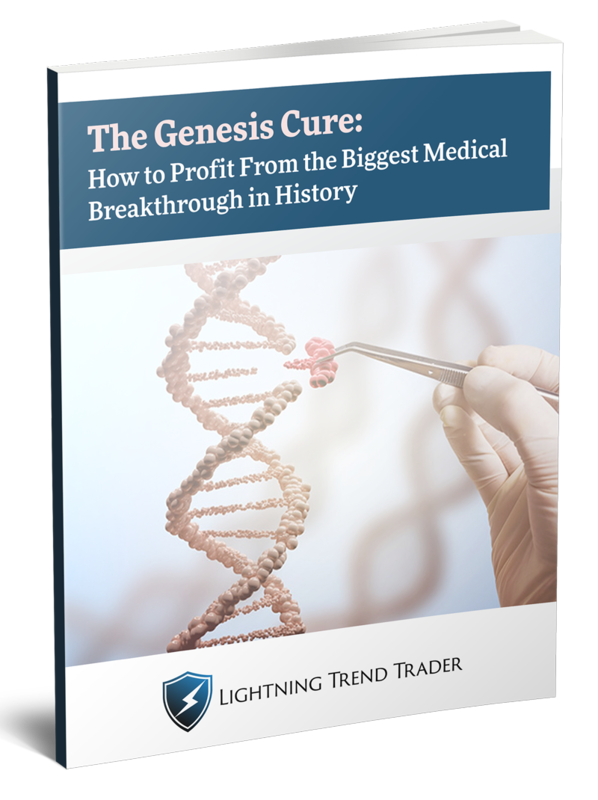 You’ll see exactly what steps to take to potentially make 3,000% on this small biotech royalty company. But I won’t just leave you with the report. 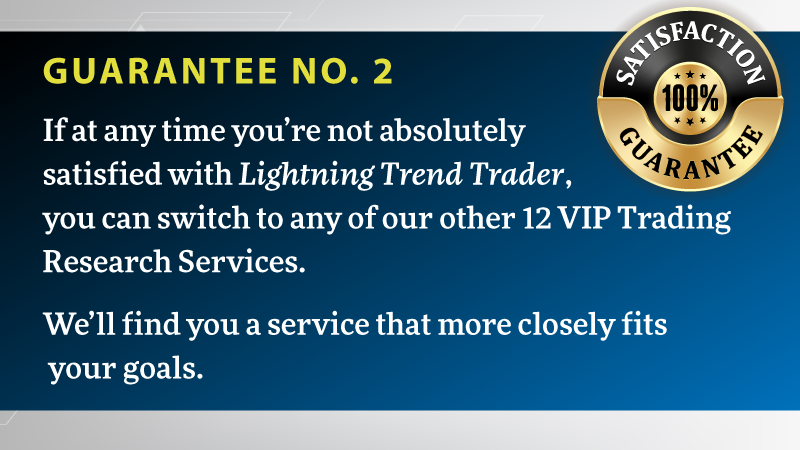 You’ll also have a free year of Lightning Trend Trader, where I’ll guide you every step of the way. And how you can use my service to accumulate riches far faster than you ever thought possible. 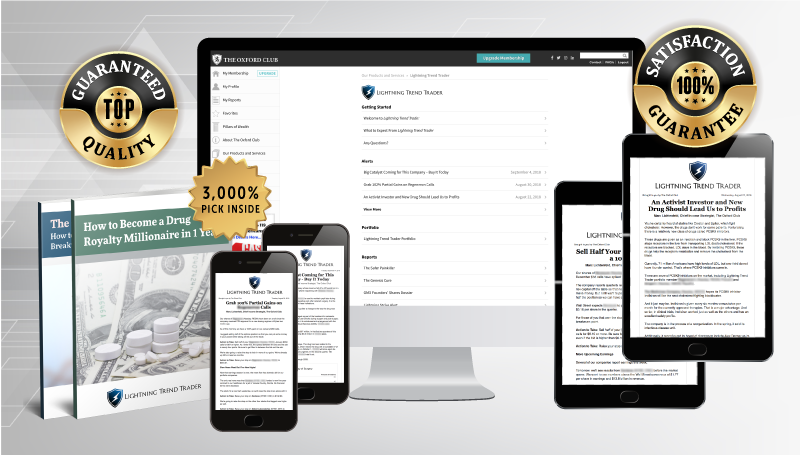 Lightning Trend Trader is an elite research service that costs $4,000 per year. As soon as you subscribe, I’ll send you an email with a private password. This password is the only way to log into the Lightning Trend Trader website. Please do not share this with anyone. 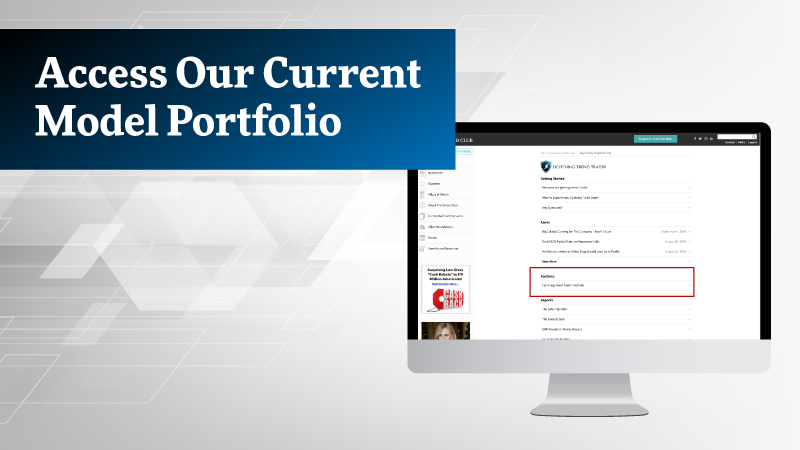 Once you log in, you’ll have access to our current model portfolio. It has quite a few open “Buy” recommendations you can act on TODAY. Each of these recommendations is primed for a Lightning Strike in the next few months – at the latest. Every month, I’ll send you one to three MORE recommendations. Each represents a Lightning Strike coming your way. 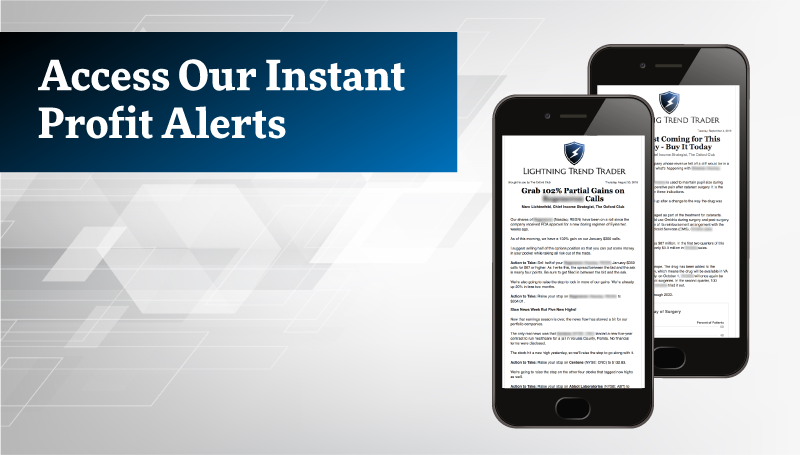 These recommendations will come in the form of instant profit alerts in your inbox. I’ll detail everything you need to know in a quick email. And position yourself for Lightning Strike after Lightning Strike! These little-known market events have led my subscribers to top gains of 419%... 775%... 1,039%... and 2,381%! Lightning Strikes are a great way to build your fortune... or even catch up on retirement savings. Including this one from Kevin Hannigan. When he started following me, he had $381,000 in his investment account. And I realize it takes more than just a hot stock tip to get there. When you’re on my elite Lightning Trend Trader list, I don’t just send you on your way with some picks. 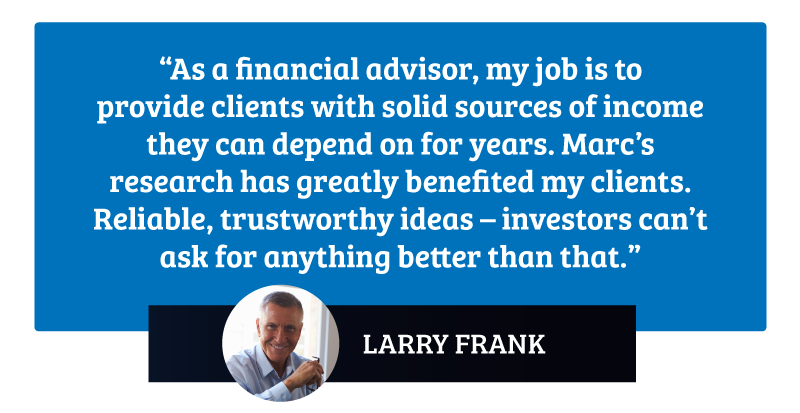 I’ll send you top-of-the-line research on the markets and each recommendation so you can decide if it’s right for you. And I’ll be here every step of the way on your journey to a million dollars. I have one more bonus I’d like to send you today. But very rarely do I come across true CURES. I recently discovered a technology that could wipe 4,800 so-called “incurable” diseases from the face of the Earth. I believe they’re underselling it. The fact is... this technology might just be the most remarkable, lifesaving and lucrative medical breakthrough of all time. It has the power to erase genetic diseases at their source, quickly and inexpensively. This means it could cure as many as 4,800 diseases... and take over a $1 trillion market. One small Boston lab behind this technology could hand you 2,907% gains. Clinical trials on this technology are set to start very soon, so you’ll want to get in as soon as possible. Today, ideally. 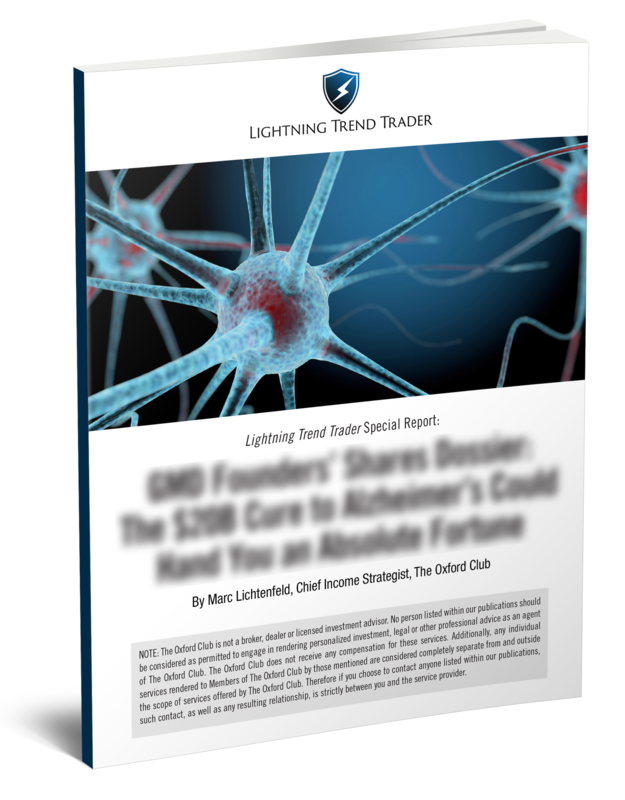 So when you claim your free year of Lightning Trend Trader, I’ll also rush you a copy of my breakthrough report on this opportunity. But I’ll send it to you for FREE today when you join Lightning Trend Trader. Along with a free year of access to my market-thrashing service, where you’ll get another 12 to 36 picks set to experience Lightning Strikes over the next year. I’m willing to make you a special offer. As I said before, one year of my service costs $4,000. And today I’m giving an extra year free to anyone who signs up for my service. So you’ll actually get two years total. 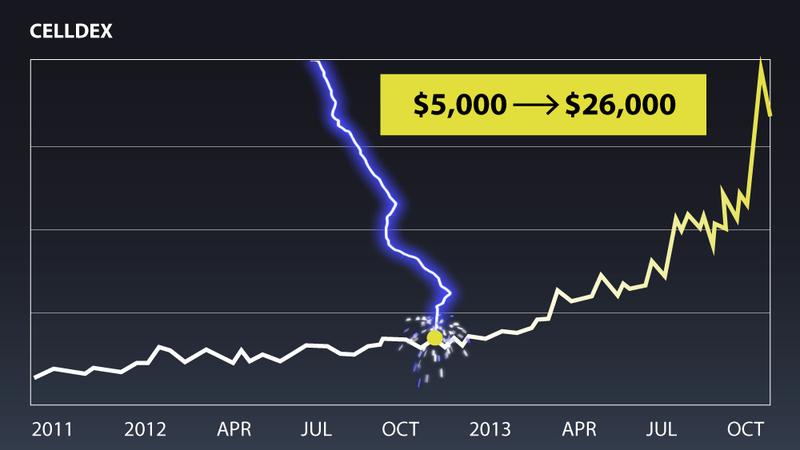 So for the price of $4,000, the one-year price, you’ll actually get a total of two years of Lightning Trend Trader. It’s perhaps the best deal I’ve ever made for my service. And I’m making it purely because I want to ensure NOBODY misses out on the opportunity to take advantage of this play. That wouldn’t be fair to honest people like you who are serious about becoming a millionaire. We also would not be able to stay in business that way. However, I want to honor the fact that you’re putting your trust in me today. So I have not one... but TWO guarantees today. I mentioned earlier that I’m GUARANTEEING a chance for a 3,000% gain. Now, keep in mind, I can make this guarantee only until AFTER a full year’s subscription is up. 3,000% doesn’t happen overnight, so all I ask is that you give me the full chance to deliver. And if I don’t, just call us up, and the credit will be yours. And as a thank-you for signing up for my service, you can keep your special reports, no hard feelings. But that’s how much I want you in on my service today. I’m confident you’re going to love it. My current subscribers are thrilled with my research. And my research is so thorough and low-risk, professional investment advisors look to me for help. I want you to be the next reader to benefit from my research. This is Your Chance at a “Redo” on Becoming a Millionaire! Too many people missed out last time. 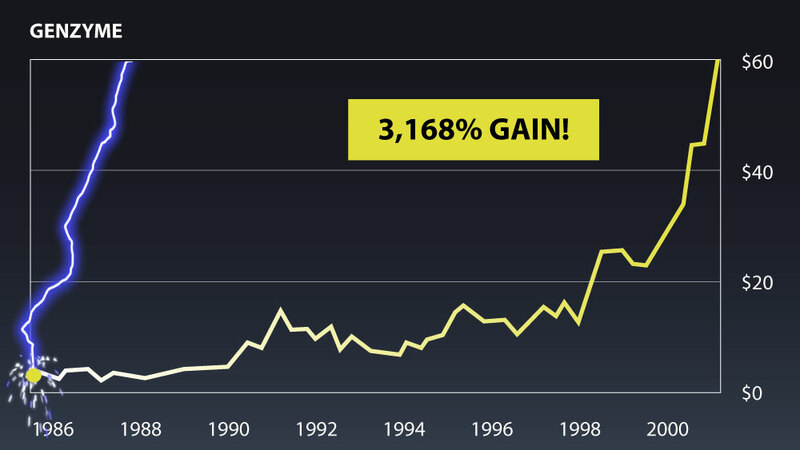 My 2,381% gain could have changed your life in just 10 months. With my newest biotech royalty play, you have the chance to collect 3,000%. So if you pass up on this opportunity, there’s really nothing else I can do for you. You’re better off clicking out right now. I don’t want to take any more of your time. Yes, everyone says they want to get rich. Perhaps you always dreamed of becoming a millionaire. But very few people want to make a change in their actions to get there. More importantly, almost no one thinks about WHY they want to be rich. Having the right reasons in mind will make it so much easier to achieve your goal. Do you want to travel the world without a second thought? Do you want to buy that second home in your favorite vacation spot? Or maybe you just want to sleep well at night, knowing all your finances are in order. This video is your opportunity to finally achieve your goals with an expert by your side. And I’m giving it away for FREE, along with a free year of Lightning Trend Trader. Sign up before midnight tonight to ensure you have the chance to become a millionaire in one year. Click the “YES! I want the chance to make $1 million” button below to get started now. It’ll take you to a secure page where you can review everything before it’s final. And I’ve told you the stories of people who collected as much as $2.7 million by following my research. And so we know where to send your free year’s worth of Lightning Trend Trader alerts and guidance. I even have a special bonus for you when you click through to the next page. 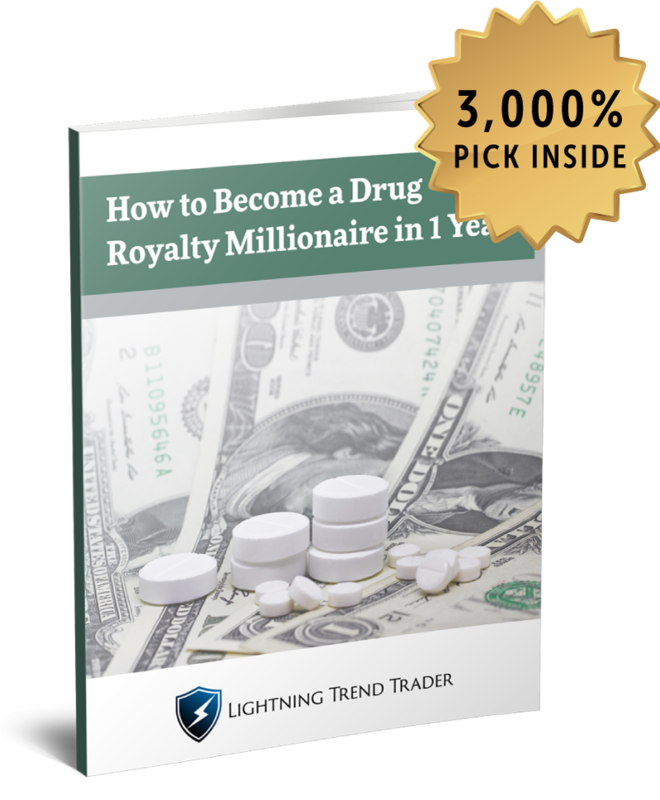 And claim your free year of Lightning Trend Trader!